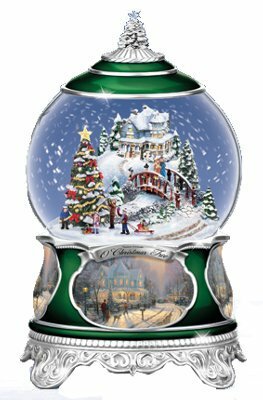 Exclusively from The Bradford Exchange, each Thomas Kinkade snowglobe in this collection is exquisitely handcrafted in artists' resin, meticulously hand-painted and features a fully-sculpted winter scene inspired by the Painter of Light?. A flip of the switch illuminates each charming scene while a gentle shake sets swirling snow in motion. For added delight, each issue's base is graced with a silvery name plaque and Thomas Kinkade artwork. Plus, each festive issue plays a beloved holiday melody.